Macau, Oct 22 : Gaganjeet Bhullar lifted the Macao Open trophy for the second time in his career after closing with a three-under-par 68 to complete a stunning wire-to-wire victory on Sunday. The 29-year-old Bhullar fired seven birdies against two bogeys and a double-bogey to win by three shots with a 13-under-par 271 total for his eighth Asian Tour victory at the Macau Golf and Country Club. Bhullar took home the winner's prize purse of $90,000 and became only the third player after Australian Scott Hend (2013, 2015) and Zhang Lian-wei of China (2001, 2002) to win the event twice since the tournament was inaugurated in 1998. 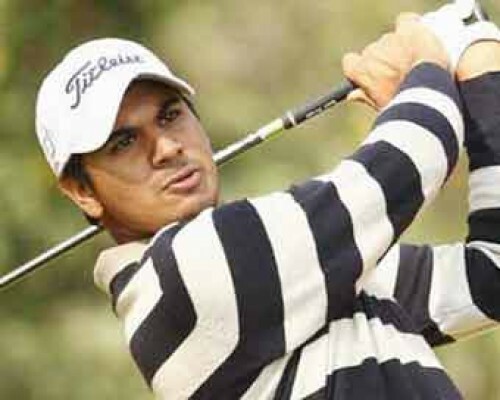 Filipino ace Angelo Que battled to a 69 to share second place with Ajeetesh Sandhu of India, who posted a 70, at the $500,000 Asian Tour event. Chinese Taipei's Hung Chien-yao took fourth place following a 72 for a 276 total. India's Rashid Khan returned with the day's lowest round of 64 to grab a share of fifth place on a 278 total alongside American Johannes Veerman, who closed with a 70 in the Macau showpiece. China's Lin Yuxin, the only amateur to make the halfway cut, produced the shot of the day when his five-iron from 240 yards found the bottom of the cup for a magical albatross on the par-five 18th hole.